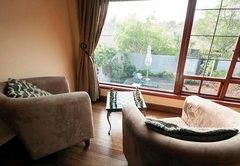 Harfield Guest Villa is a highly recommended B&B with self catering option, providing accommodation in Claremont for tourists visiting the Southern Suburbs region. 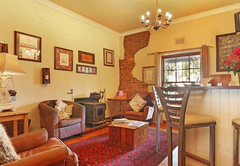 Harfield Guest Villa is situated in Harfield, a village rich in character and steeped in indigenous history. 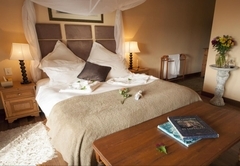 Allow yourself the opportunity to relax in a warm, intimate and cosy haven far from the madding crowd. 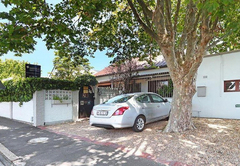 Safe walking distance to village restaurants, near Cavendish Square and Claremont business district, Kingsbury and Claremont Hospitals, Newlands Rugby and Cricket grounds, UCT, Kirstenbosch Gardens, Golf courses. 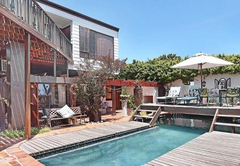 15 minutes to the Airport, Waterfront, City and Beaches. 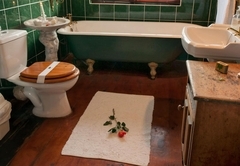 All our bedrooms are en-suite and luxuriously appointed with internet access, TV with shared satellite, telephone, radio, hairdryer, air-conditioning, mini-bars, hospitality trays, candle-lit baths, pure cotton linen and exceptional attention to detail. 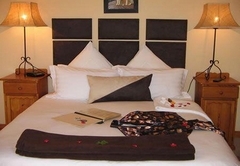 All rooms are equipped with mini bar and tea and coffee making facilities. We have added unique special touches to make our rooms truly memorable. 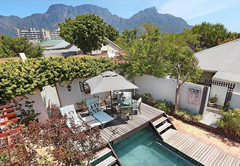 This includes personalised chocolates on your pillow, candle-lit baths, hot water bottles, champagne breakfast (for special occasions) on your patio with Table Mountain as your backdrop and a reflecting pool by your side. Rooms are brought to life with a scattering of fresh flowers and greenery. 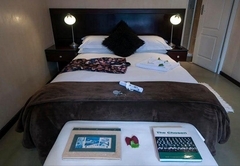 Special care is taken to ensure that your stay at Harfield Guest Villa is unforgettable in the best possible way! Elegant and luxurious rooms with their own private entrances. 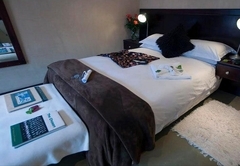 These rooms are equipped with tea and coffee making facilities, mini-bar fridges and free internet Wi-fi, heaters and TV with SABC1, 2, 3, ETV, M-Net and DStv options. 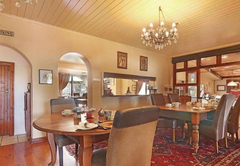 Exquisitely decorated with stunning mountain views, extra long queen-size bed. 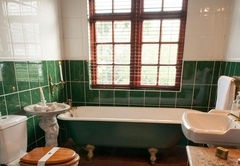 Candle-lit Victorian bath, air-conditioning, tea and coffee making facilities, mini-bar fridges and free internet Wi-fi, heaters, in room safes .TV with SABC1, 2, 3, ETV, M-Net and DStv options. The perfect, private self-contained / B&B units. 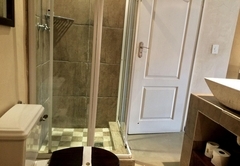 Double en-suite, spare room, wonderful décor, private gardens, private entrances, fully equipped kitchen, tea and coffee making facilities, mini-bar fridges and free internet Wi-fi, heaters and TV with SABC1, 2, 3, ETV, M-Net and DStv options. We would like to make this special time even more memorable for you. 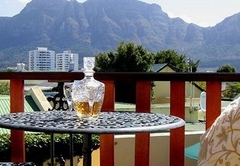 Enjoy breakfast in the privacy and comfort of your room, with a complimentary bottle of sparkling wine and relax with Table Mountain as your back drop. Sit back and relax while Harfield Guest Villa takes care of your every need. 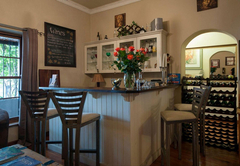 Harfield Guest Villa offers an amazing breakfast which is complimented with fresh home baked breads, muffins and croissants. We also offer breakfast to outsiders and provide the perfect breakfast for that special occasion. 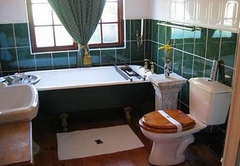 Harfield Guest Villa also caters for the discerning business and leisure guest. 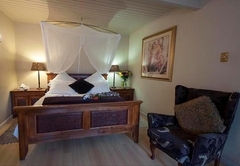 Spacious double room with an extra long queensize bed and private patio alongside swimming pool, separate shower, air conditioned. Loft Style with pitched roof. Beautifully decorated. Bath only. No shower. May not be suitable for very tall guests. 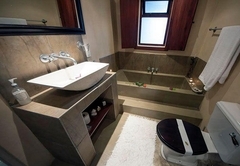 Equipped with tea and coffee making facilities, mini-bar fridges and free internet Wi-fi, heaters and TV with SABC1, 2, 3, ETV, M-Net and DStv options. 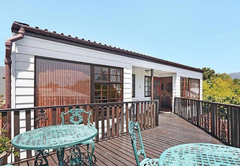 A secure, private self-contained/self catering/B&B unit. Two double bedrooms, both en-suite with heated towel rails, lounge, fully equipped kitchen and private garden with separate entrance. There is space in the lounge to sleep a child. Really special. I loved this place. Room was clean and neat with so much character. Big clawfoot tub in the bathroom. Rosemary sprigs in the tub on on the pillows, Chocolates on the pillow, sherry in a pretty decanter, aspirin just in case you needed it, coffee in your room with milk and a wonderful healthy breakfast. The hostess was very nice and took such great care of the guests. I would highly recommend this place if your looking for charm and a hosts that have thought of everything. 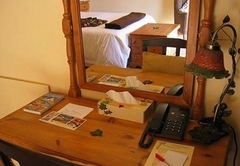 Response timeHarfield Guest Villa typically responds to requests in 5-10 minutes.